CHICAGO – Hot opportunity! In our latest meet the celebrity edition of HollywoodChicago.com Hookup: Film, we have 5 admit-two wristbands up for grabs for the highly anticipated “The Hunger Games” in-person celebrity autograph signing! This event is on March 7, 2012 with stars Josh Hutcherson, Isabelle Fuhrman and Jacqueline Emerson! 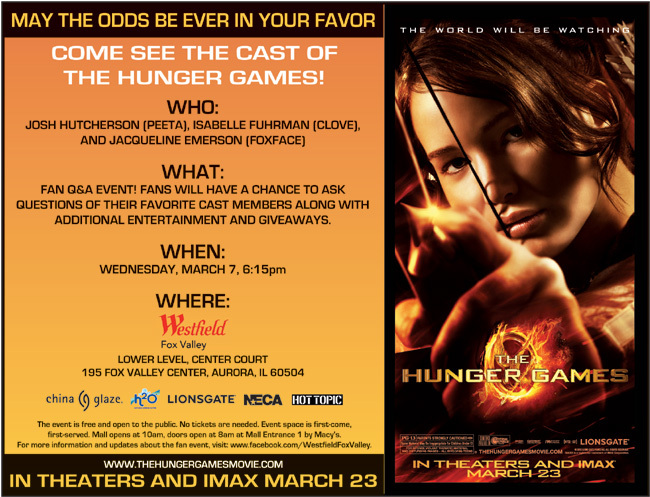 This must-attend mall event for “The Hunger Games” includes a fan Q&A with the film’s stars. The Q&A is open to the public. Prior to the fan Q&A, HollywoodChicago.com is offering to 10 lucky winners wristbands for autographs with your favorite “The Hunger Games” stars! You must have a wristband for the celebrity autograph signing. Josh Hutcherson, Isabelle Fuhrman and Jacqueline Emerson will be at Westfield Fox Valley (lower level, center court, 195 Fox Valley Center, Aurora, Ill.) for a Q&A at 6:15 p.m. on Wednesday, March 7, 2012. Prior to the Q&A, our wristband winners will enjoy autograph signings at 4:30 p.m.! “The Hunger Games” also stars Jennifer Lawrence, Elizabeth Banks, Woody Harrelson, Stanley Tucci, Lenny Kravitz, Donald Sutherland, Liam Hemsworth, Toby Jones, Leven Rambin, Amandla Stenberg, Willow Shields, Wes Bentley and Alexander Ludwig from writer and director Gary Ross. Lionsgate will release “The Hunger Games” everywhere on March 23, 2012. To experience “The Hunger Games” online, visit the film’s official Web site. To win your free wristband for “The Hunger Games,” just answer our question in this Web-based submission form. That’s it! Directions to enter this Hookup and win are below. “The Hunger Games” celebrity event in Aurora, Ill. on March 7, 2012. Every year in the ruins of what was once North America, the evil Capitol of the nation of Panem forces each of its 12 districts to send a teenage boy and girl to compete in The Hunger Games. A twisted punishment for a past uprising and an ongoing government intimidation tactic, The Hunger Games are a nationally televised event in which “Tributes” must fight with one another until one survivor remains. Pitted against highly trained Tributes who have prepared for these games their entire lives, Katniss is forced to rely on her sharp instincts as well as the mentorship of drunken former victor Haymitch Abernathy. If she’s ever to return home to District 12, Katniss must make impossible choices in the arena that weigh survival against humanity and life against love. “The Hunger Games” is directed by Gary Ross and produced by Nina Jacobson’s Color Force in tandem with producer Jon Kilik. Suzanne Collins’ best-selling novel – the first in a trilogy published by Scholastic that has more than 23.5 million copies in print in the U.S. alone – has developed a massive global following. The movie trailer for “The Hunger Games” can be watched now below. To secure your free “The Hunger Games” wristband, you must be logged into your HollywoodChicago.com Web site account. If you don’t yet have one, you can quickly register here. Having a free Web site account with a valid e-mail is required to win this Hookup. Next, simply answer our question. You must submit your answer using this confidential, Web-based submission form. Comments have been disabled on this page. What makes you an uber fan of “The Hunger Games”? Note: Comments are disabled on this page. This HollywoodChicago.com Hookup is simple: 5 HollywoodChicago.com readers will be randomly selected as the winners of our “The Hunger Games” wristband Hookup! The winners will be snail mailed their wristbands (via overnight mail) at our expense. Good luck!